1. Preheat oven to 350 degrees. Spray four 1/2-cup custard cups with cooking spray. 2. In a bowl, whisk together egg, cooled melted butter, and milk. In another bowl, combine flour, 1/2 cup brown sugar, 3 tablespoons cocoa, baking powder, and salt. 3. Make a well in center of flour mixture and pour in egg mixture. Stir until just combined and flour is no longer visible. Evenly divide batter into prepared custard cups. 4. In a small bowl, combine espresso and remaining 2 tablespoons each brown sugar and cocoa. Add boiling water and stir until all ingredients have dissolved. Evenly pour hot espresso mixture over batter (about 3 tablespoons per cup). Place cups on a cookie sheet and bake for 20 to 25 minutes or until espresso is just absorbed and cakes are set. 5. Remove from oven and set on a rack to cool for about 15 to 30 minutes. 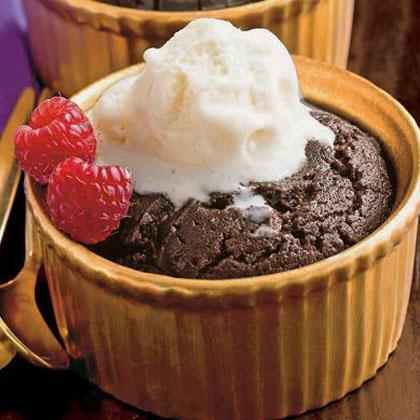 Top each pudding cake with a spoonful of frozen yogurt and raspberries.